The holidays are coming rapidly now! Have you started to think of gifts? 16 Foodie Gift Subscription Boxes for the Holidays will give you a start! I love a great mail order type of gift, not only is it easy for me but it is exciting for the recipient too. For some of these gift giving companies offer a subscription so you can give a 3 month or year subscription depending on how much you are willing to spend. You can also do a one off too! These are new to me but such a wonderful way of sharing the love of food with your family and friends. I have recently received a box from The Taste Box and a few nights ago we cooked up one of the best Italian pasta meals we have had at home. All of us devoured it and went back for more! This is what was in the box, wonderful Italian pasta, tomato sauce, San Marzano tomatoes, delicious olive oil, Fleur de Sel and truffle oil. The box was entitled Pasta is Love and for me I fell deeply in love with this box of goodies. I started by sauteing up a onion with a heaping tsp. of garlic in the wonderful olive oil. I added in a pound of lean beef to brown. Threw in a tsp. of thyme and another of oregano, then the vibrant San Marzano tomatoes went in and I turned the heat up to high to reduce as I was breaking them down with a wooden spoon. Then I added in the two jars of sauce and turned down the heat to let the scrumptious mixture now simmer slowly for about 1/2 an hour. Just before serving I amped up a pot of boiling salted water for the pasta and cooked that to al dente. And for the final touch on the sauce I threw in 4 large handfuls of baby spinach and cooked it down to add in more veggies and some color. I placed the pasta right from the pot to the sauce and stirred it in. We plated and sprinkled a little Fleur de Sel on and a drizzle of truffle oil. And it was AMAZING!! It was gobbled down before I could snap a picture! Now wouldn’t something like this make the best gift for the foodie on your list or for anyone actually as we all need to eat!! 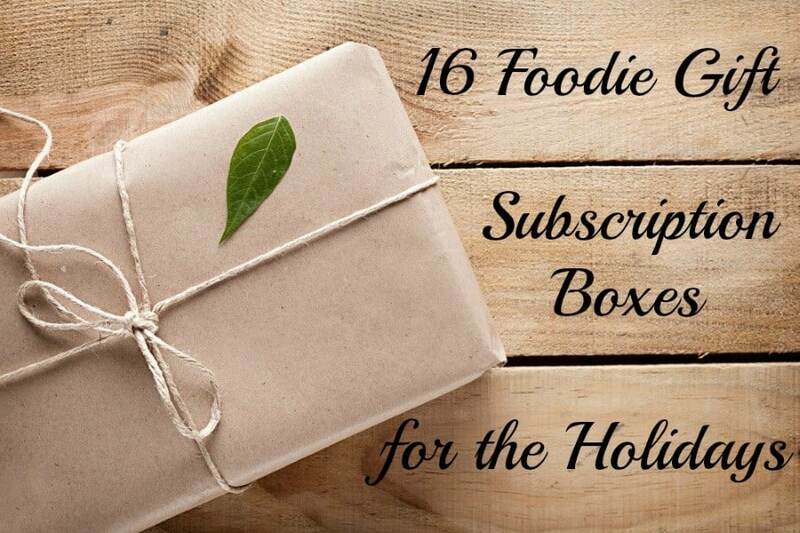 Below I have a list of 16 Foodie Gift Subscription Boxes for the Holidays, ENJOY! Each month, you’ll receive 3-4 full size chef-inspired food and drink products designed to inspire you to make incredible food. For the December’s box I have a great coupon for you for 50% off, so instead of $29.95 you can get the box for ony $14.95!! That is a huge savings to try something fantastic. All you need to do is enter HALFOFF in the shopping cart at time of purchase. It is that easy!! Ships within Canada and the US. Expats rejoice! Expack is the first monthly subscription service for expatriates. Every month, members receive a box of carefully curated goodies from their home country. There’s no place like home, and there’s no box like Expack! Ships within US. Snack confidently knowing that everything Naturebox makes is created with high-quality ingredients that are free from artificial colors, flavors, or sweeteners. They also have a number of vegan, non-GMO, and gluten-free options. Each snack is full on flavor to keep you and your tastebuds happy. It’s time to start feeling great about snacking. Get 50% off your first order! Ships within US and Canada. Discover new wines by the glass with limited production wines delivered to your door. Some of the best wines in the world never make it to the United States. So we go to them, scouring the greatest wine regions in the world in search of the known and unknown. You can’t find these wines at the corner store. Ships within the US. A chef curated box of favorite food products, kitchen tools and exclusive recipes. Each box contains a selection of the chef’s favorite cooking products and kitchen tools, a personal letter from the chef and exclusive recipes. It’s like receiving a gourmet gift from a top-name chef, delivered right to your door! Get one for yourself and one for your favorite food enthusiast! Currently shipping only to the US but hoping to open up to Canada soon. For 75 years, Di Bruno Bros. has offered nothing but the highest quality products, infused with the story of the people who made them. Their story is a story of discovery, of two brothers, aunts and uncles, of Culinary Pioneers, and the beautiful city of Philadelphia. Ships within the US. Travel the world without leaving home! Each month, we’ll send everything you need to create fun, memorable food and travel experiences with your family or friends. There’s something for all five senses. You’ll see, hear, taste, touch and smell a different country!. Open up your palate, and your mind to the different experiences the world has to offer! (without taking an actual trip, of course). Ships within Canada (extra charges apply) and the US (free shipping). 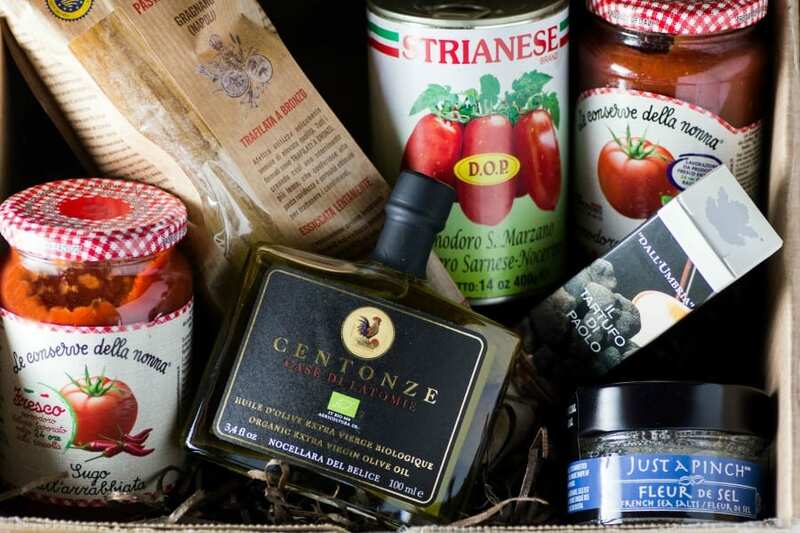 NonnaBox curates a box of hard-to-come-by artisanal products that are produced the traditional way — the Nonna way. These products, some of which they use in the box’s recipes, are available in limited quantities and therefore can’t just be found at your local grocery store. Ships within the US. Yummy Bazaar is a shopping destination for curated gourmet food from around the world delivered at great value and with exceptional customer service. Ships within continental US, Puerto Rico, Hawaii, Alaska and Guam. Shipping to Canada soon. Teabox offers a handpicked selection of the freshest and the finest teas from India and Nepal. Our catalog features a wide selection of single-origin teas from over 150 tea gardens across Darjeeling, Assam, Kangra, the Nilgiris, and Nepal. In addition, there is an exciting range of iced teas, flavored and non-flavored blends to choose from. Worldwide shipping. RawSpiceBar helps you add the freshest flavors to your meals quickly and healthily but without all the salts, sugars, chemical fillers and unwanted additives generally found in pre-ground grocery store spices & seasonings, which typically lost their flavor months ago. Ships internationally. Carnivore Club is the world’s first curated cured meat of the month club featuring artisans from around the world. Each month our members receive an impressive faux-wood box filled with 4-6 handcrafted cured meats from top artisans. Like wine, the laborious craft of cured meats is an art form that requires the diligent pursuit of perfection through endless hours of trial and error. Carnivore Club celebrates the individual recipes of each cured meat savant, no two meats are alike even when similar in name. Ships within Canada, US and the UK, free shipping. Each month you’ll get a box of the best artisan sweets from ever-changing confectioners all over the country. When you find a sweet you loved from a monthly box, easily order more through their store! Ships within US. Choose a trunk, pick a theme, a subscription or build your own. Create a custom greeting card and enjoy gourmet recipe cards. Free shipping on orders over $35. Ships within the US. Whether you subscribe for yourself to learn about the vast world of wine as a “wine correspondence course” or are giving a membership as a thoughtful gift, the Wine of the Month Club® is the premier wine club in America. Each shipment is accompanied by their famous “Wine Letter.” Ships within the US. Chef prepared meals, order as little or as much as you like. Flash frozen and delivered to your door. When ready to eat just follow the simple heating instructions for a delicious meal. Ships within the US. For more subscription boxes exclusive to Canada come over to Simply Stacie!! These are affiliate links and I thank you for your support. This is a PERFECT gift for a friend of mine! She is a HUGE foodie! Thank you for this idea for christmas! She will LOVE it! You are so welcome, enjoy! And I hope she does too! Thank you so much for sharing this information! I have a HUGE foodie friend, and I could not figure out what to get her this year. Now I have a ton of options. I love these foodie gift subscription ideas. My oldest would love some of these. Thanks Jenn, I love them too! Just look at all that delicious food. I am in love. 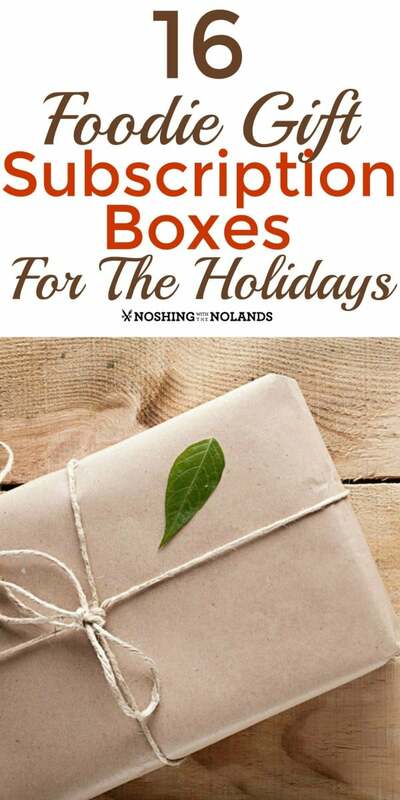 I would love to try these holiday boxes. Nothing beats not having to go to the store to get my groceries. Just have them delivered to my door. They are so much fun, I love them, thanks Dawn!! These all look so good! I think I might just use this post as my own Christmas wish-list this year. 😉 Thanks for sharing! I love to give subscription boxes for gifts. These are great boxes for every food lover. My friend gets The Taste Box and she loved it. These are all great gift ideas. These are great gift ideas for foodies. The Vine Box is the first one I would like to try. There are so many subscription boxes out there, it’s hard to keep track! Thanks for listing these ones – they all look great and would make great presents. I would loooove some of those boxes! Will show your list to hubby! Can’t wait to check them all out! Thank you for rounding these all up. I have been looking for a box for my brother. These are so cool! My hubby will surely enjoy these! Awesome! Thanks for sharing these! So many choices! I love all things food and so this would be perfect for anyone in my life for a gift. Taste Trunk, Treatsie or Carnivore Club might be good options. Click on through to their website and have a look. Some of them you can design yourself to match what he likes. I have sent out a bunch of these this Christmas and they are a great gift idea!